Contained in the third version of this esteemed masterwork, countless numbers of the main unique specialists from world wide supply modern-day top solutions to each query that arises on your perform. They carry in-depth tips on new diagnostic techniques, operative procedure, and remedy choice, in addition to cogent motives of each new clinical notion and its scientific significance. With its new streamlined, extra easy, full-color structure - in addition to entry to the total contents on-line - this third variation makes reference a lot quicker, more uncomplicated, and extra flexible. greater than ever, it is the resource you must successfully and expectantly triumph over any medical problem you'll face. 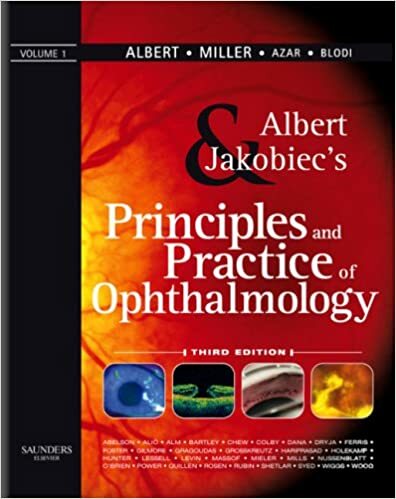 Comprehensive, authoritative, and richly illustrated assurance of each clinical and scientific precept in ophthalmology guarantees that you're going to continuously be ready to locate the information you must diagnose and deal with your sufferers' ocular difficulties and meet modern-day criteria of care. Updates contain thoroughly new sections on "Refractive surgical procedure" and "Ethics and Professionalism"... an up to date and elevated "Geneitcs" section... an up to date "Retina" part that includes OCT imaging and new drug cures for macular degeneration... and lots of different very important new advancements that impact your sufferer care. A streamlined structure (now 4 volumes rather than six) and a brand new, extra elementary full-color layout - with many at-a-glance precis tables, algorithms, bins, diagrams, and millions of exceptional colour illustrations - enables you to find the help you would like extra speedily than ever. Access to the whole contents of the four-volume set on-line - with fast seek services and downloadable illustrations - allows you to speedy and powerfully reference the cloth from any computer. Your buy entitles you to entry the website till the following version is released, or until eventually the present variation isn't any longer provided on the market by way of Elsevier, whichever happens first. If the following version is released lower than twelve months after your buy, you'll be entitled to on-line entry for 12 months out of your date of buy. Elsevier reserves the fitting to provide an appropriate alternative product (such as a downloadable or CD-ROM-based digital model) may still entry to the website be discontinued. This wonderful e-book includes many various scripts, appropriate to a couple of designated populations. 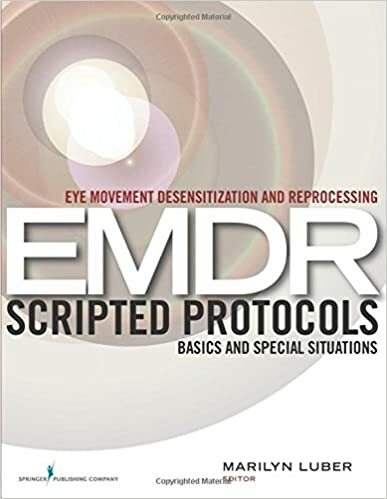 It takes a realistic method and walks therapists step by step throughout the EMDR healing technique. [Readers] aren't dissatisfied. " rating: ninety three, four stars --Doody's compliment from a training EMDR therapist and consumer of Eye flow Desensitization and Reprocessing (EMDR) Scripted Protocols: "Kudos to. 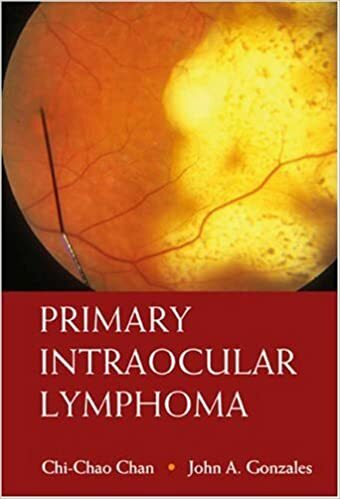 Crucial studying for either scientific scholars and teachers within the fields of ophthalmology, neurology and oncology, this can be the 1st textbook to hide the topic of basic intraocular lymphoma (PIOL). The e-book serves to teach ophthalmologists, neurologists and oncologists on a illness procedure that's frequently tricky to diagnose. 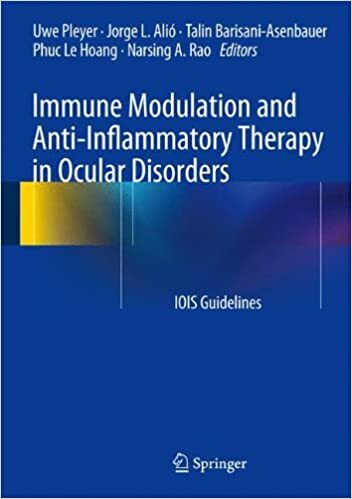 Those guidance, compiled via a panel of clinicians and scientists with a excessive point of craftsmanship, objective to supply readers with the main updated and accomplished directions at the remedy and prevention of ocular irritation. the entire innovations are explicitly associated with helping proof and graded in keeping with the power of that facts and the editors have made each attempt to make sure that chapters are of a always excessive methodological caliber. This moment version textual content specializes in a case-based studying method that includes decision-making info provided in algorithmic structure. 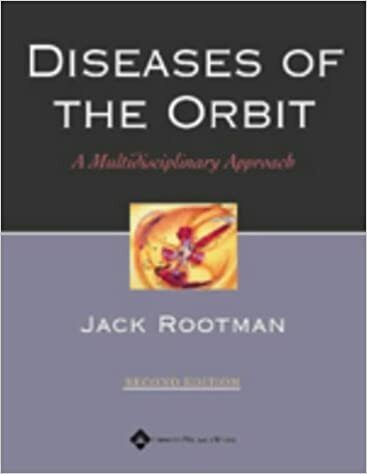 Sections lined are the anatomy of the orbit, pathophysiologic and anatomic rules in classifying, diagnosing and investigating orbital ailment, illnesses of the orbit, and the administration of these illnesses. M. Kirby Center for Molecular Ophthalmology Scheie Eye Institute University of Pennsylvania School of Medicine Philadelphia PA USA Roberto Pineda II MD Assistant Professor Massachusetts Eye and Ear Inﬁrmary Chief of Ophthalmology, Brigham & Women’s Hospital, Boston Assistant Professor, Department of Ophthalmology, Harvard Medical School Boston MA USA Misha L Pless MD Director, Division of General Neurology Massachusetts General Hospital Boston MA USA Howard D Pomeranz MD PhD Clinical Associate Professor Department of Ophthalmology North Shore Long Island Jewish Health System Great Neck NY USA Constantin J Pournaras MD Department of Ophthalmology Geneva University Hospitals Geneva Switzerland William Power MBBCH FRCS FRCOphth Consultant Ophthalmic Surgeon Blackrock Clinic Blackrock Co Dublin Ireland Manvi Prakash MD Postdoctoral Fellow Joslin Diabetes Center Beetham Eye Institute Harvard Medical School Boston MA USA xxxviii Anita G Prasad MD Department of Ophthalmology and Visual Sciences Washington University Medical School St Louis MO USA Valerie Purvin MD Clinical Professor of Ophthalmology & Neurology Departments of Ophthalmology and Neurology Indiana Medical Center Indianapolis IN USA David A Quillen MD George and Barbara Blankenship Professor and Chair Department of Ophthalmology Penn State College of Medicine Hershey PA USA Graham E Quinn MD Attending Surgeon, Research Fellow Department of Ophthalmology The Childrens Hospital of Philadelphia Philadelphia PA USA Melvin D Rabena BSc Director of Research California Retina Consultants Santa Barbara CA USA James L Rae PhD Professor of Ophthalmology and Physiology Physiology and Biomedical Engineering Mayo Clinic Rochester MN USA Michael B Raizman MD Ophthalmic Consultant Ophthalmic Consultants Of Boston Associate Professor of Ophthalmology Tafts University School of Medicine Boston MA USA Alessandro Randazzo MD Department of Ophthalmology Istituto Clinico Humanitas Rozzano Milano University Milan Italy Narsing A Rao MD Professor of Ophthalmology and Pathology Doheny Eye Institute University of California Los Angeles CA USA Christopher J Rapuano MD Co-Director Cornea Service Co-Director Professor of Ophthalmology, Jefferson Medical College Thomas Jefferson University Co-Director, Cornea Service Refractive Surgery Department Wills Eye Hospital Philadelphia PA USA Sherman W Reeves MD MPH Cornea, External Disease and Retractive Surgery Minnesota Eye Consultants Minneapolis MN USA Carl D Regillo MD FACS Professor of Ophthalmology Wills Eye Hospital Philadelphia PA USA Elias Reichel MD Associate Professor of Ophthalmology Vitreoretinal Diseases New England Eye Center Tufts University School of Medicine Boston MA USA Martin H Reinke MD Private Practice Southlake TX USA Douglas Rhee MD Assistant Professor of Ophthalmology Department of Ophthalmology Massachusetts Eye and Ear Inﬁrmary Harvard Medical School Boston MA USA Claudia U Richter MD Ophthalmic Consultants of Boston Boston MA USA Joseph F Rizzo lll MD Associate Professor of Ophthalmology Massachusetts Eye and Ear Inﬁrmary Harvard Medical School Boston MA USA Richard M Robb MD Associate Professor of Ophthalmology Harvard Medical School Department of Ophthalmology Children’s Hospital Boston Boston MA USA Anja C Roden MD c/o Diva R Salomao MD Department of Pathology Mayo Clinic Rochester MN USA I Rand Rodgers MD Assistant Clinical Professor, Mount Sinai Medical Center Director of Ophthalmic Facial and Plastic Surgery North Shore University Hospital NYU Private Practice New York NY USA Merlyn M Rodrigues MD PhD c/o Kelly S Keefe MD Naval Medical Center San Diego CA USA Yonina Ron MD Department of Ophthalmology Rabin Medical Center Beilinson Campus Petah Tiqva Israel Geoffrey E Rose DSC MS MRCP FRCS FRCOphth Consultant Ophthalmic Surgeon Adnexal Department Moorﬁelds Eye Hospital London United Kingdom List of Contributors Emanuel S Rosen MD FRCS FRCOphth Consultant Ophthalmic Surgeon Manchester Central Health Care Authority Manchester United Kingdom James T Rosenbaum MD Professor of Medicine, Ophthalmology and Cell Biology Chief, Division of Arthritis and Rheumatic Diseases Director, Uveitis Clinic Casey Eye Institute Oregon Health and Science University Portland OR USA Perry Rosenthal MD Assistant Clinical Professor of Ophthalmology Department of Ophthalmology Boston Foundation for Sight Boston MA USA Strutha C Rouse II MD Horizon Eye Care Charlotte NC USA Mark S Ruttum MD Professor of Ophthalmology Head, Pediatric Ophthalmology and Adult Strabismus Section Medical College of Wisconsin Milwaukee WI USA Michael A Sandberg PhD Associate Professor of Ophthalmology Berman-Gund Laboratory Massachusetts Eye and Ear Inﬁrmary Harvard Medical School Boston MA USA Allan R Rutzen MD FACS Associate Professor of Ophthalmology Department of Ophthalmology University of Maryland Baltimore MD USA Virender S Sangwan MD Head, Cornea and Anterior Segment Services L V Prasad Eye Institute Hyderabad India Edward T Ryan MD Director, Tropical & Geographic Medicine Center Massachusetts General Hospital Associate Professor of Medicine Harvard Medical School Assistant Professor Dept of Immunology and Infectious Diseases Harvard School of Public Health Boston MA USA Barry W Rovner MD Professor & Medical Director Department of Psychiatry and Human Behavior Thomas Jefferson University Philadelphia PA USA Alfredo A Sadun MD PhD Thornton Professor of Ophthalmology and Neurosurgery Doheny Eye Institute Kech School of Medicine University of California Los Angeles CA USA Malgorzata Rozanowska PhD Lecturer School of Optometry and Vision Sciences Cardiff University Cardiff United Kingdom José-Alain Sahel MD Professor of Ophthalmology Head, Laboratory of Retinal Pathobiology University Louis Pasteur Strasbourg France Michael P Rubin MD Fellow in Vitreoretinal Diseases and Surgery Massachusetts Eye and Ear Inﬁrmary, Harvard Medical School Boston MA USA Leorey Saligan MD Nurse Practitioner National Eye Institute National Institutes of Health Bethesda MD USA Peter A D Rubin MD FACS Eye Plastics Consultant Brookline MA Associate Clinical Professor Harvard Medical School USA Sarwat Salim MD FACS Assistant Clinical Professor of Ophthalmology Yale Eye Center Yale University School of Medicine New Haven CT USA Shimon Rumelt MD Attending Physician Ophthalmology Department Western Galilee - Nahariya Medical Center Nahariya Israel John F Salmon MD FRCS FRCOphth Consultant Ophthalmic Surgeon The Radcliffe Inﬁrmary Oxford Eye Hospital Oxford United Kingdom Anil K Rustgi MD Professor of Medicine and Genetics Chief of Gastroenterology University of Pennsylvania Medical Center Philadelphia PA USA Diva R Salomão MD Associate Professor of Pathology Department of Pathology Mayo Clinic Rochester MN USA Tina Rutar MD Resident Department of Ophthalmology University of California San Francisco San Francisco CA USA David Sami MD Division Chief for PSF Ophthalmology CHOC Children’s Hospital Orange CA USA Maria A Saornil MD Ocular Pathology Unit Hospital Clinico Universitario Valladolid Spain Joseph W Sassani MD Professor of Ophthalmology and Pathology Pennsylvania State University Hershey Medical Center Hershey PA USA Rony R Sayegh MD Research Fellow Cornea and Refractive Surgery Service Massachusetts Eye and Ear Inﬁrmary Department of Ophthalmology Boston MA USA Andrew P Schachat MD Vice Chairman for Clinical Affairs Cole Eye Institute Cleveland Clinic Foundation Cleveland OH USA Wiley A Schell MD Director, Medical Mycology Research Center Assistant Professor of Medicine Department of Medicine Division of Infectious Diseases and International Health Duke University Medical Center Durham NC USA Amy C Schefler MD Resident in Ophthalmology Bascom Palmer Eye Institute Miami FL USA Tina Scheufele MD Vitreoretinal Surgeon Ophthalmic Consultants of Boston Boston MA USA Vivian Schiedler MD Oculoplastic and Orbital Surgeon, Charlottesville, VA Ophthalmic Plastic & Reconstructive Surgery Fellow Department of Ophthalmology University of Washington Seattle WA USA Gretchen Schneider MD Adjunct Assistant Professor in the Genetic Counseling program Genetic Counseling Faculty Brandeis University Waltham MA USA xxxix List of Contributors Alison Schroeder BA Laboratory Manager Department of Ophthalmology Boston University School of Medicine Boston MA USA Irina Serbanescu BA Research Division of neurology The Hospital for Sick Children Toronto ON Canada Bradford J Shingleton MD Assistant Clinical Professor of Ophthalmology, Harvard Medical School Ophthalmic Consultants of Boston Boston MA USA Ronald A Schuchard PhD Director of Rehabilitation Research and Development Center Associate Professor Department of Neurology Emory University School of Medicine Atlanta GA USA Briar Sexton MD FRCSC Fellow in Neuro-Ophthalmology VGH Eye Care Center Vancouver BC Canada John W Shore MD FACS Texas Oculoplastics Consultants Austin TX USA Joel S Schuman MD Eye and Ear Foundation Professor and Chairman Department of Ophthalmology University of Pittsburgh School of Medicine Pittsburgh PA USA Ivan R Schwab MD FACS Professor of Ophthalmology Department of Ophthalmology University of California at Davis Sacramento CA USA Adrienne Scott MD Clinical Associate Vitreoretinal Surgery Duke University Eye Center Durham NC USA Ingrid U Scott MD MPH Professor of Ophthalmology and Health Evaluation Sciences Department of Ophthalmology Penn State College of Medicine Hershey PA USA Marvin L Sears MD Professor and Chairman Emeritus Department of Ophthalmology and Visual Science Yale University School of Medicine New Haven CT USA Johanna M Seddon MD ScD Professor of Ophthalmology Tufts University School of Medicine Director, Ophthalmic Epidemiology and Genetics Service New England Eye Center Boston MA USA Theo Seiler MD PhD Professor Institut für Refractive und Ophthalmochirurgie (IROC) Zürich Switzerland Robert P Selkin MD Private Practice Plano TX USA xl Richard D Semba MD MA MPH W Richard Green Professor of Ophthalmology Wilmer Eye Institute Baltimore MD USA Tarek M Shaarawy MD Chef Clinique d’ophtalmologie Secteur du Glaucome Hôpitaux Universitaires de Génève Génève Switzerland Peter Shah BSc (Hons) MBChB FRCOphth Consultant Birmingham and Midland Eye Centre City Hospital Birmingham United Kingdom Aron Shapiro BS Director Anti-inflammatory/Anti-infectives Department Ophthalmic Research Associates North Andover MA USA Savitri Sharma MD MAMS Associate Director, Laboratory Services L V Prasad Eye Institute Bhubaneswar, Orissa India Jean Shein MD Attending Physician Crane Eye Care Hana Kukui Center Lihue HI USA Debra J Shetlar MD Associate Professor of Ophthalmology Baylor College of Medicine Staff Physician Michael E DeBakey V A Medical Center Houston TX USA M Bruce Shields MD Professor of Ophthalmology and Visual Science Yale Eye Center New Haven CT USA Carol L Shields MD Professor of Ophthalmology, Thomas Jefferson Medical College Attending Surgeon and Associate Director Wills Eye Hospital Philadelphia PA USA Jerry A Shields MD Professor of Ophthalmology, Thomas Jefferson University Director Oncology Services Wills Eye Hospital Philadelphia PA USA Lesya M Shuba MD PhD Assistant Professor Department of Ophthalmology & Visual Sciences Dalhousie University Halifax NS Canada Guy J Ben Simon MD Goldschleger Eye Institute Sheba Medical Center Tel Hashomer Israel Richard J Simmons MD Emeritus Ophthalmic Surgeon Harvard Medical School Boston MA USA Michael Simpson c/o David Miller MD Department of Ophthalmology Harvard Medical School Jamaica Plain MA USA Arun D Singh MD Director Department of Ophthalmic Oncology Cole Eye Institute and Taussing Cancer Center Cleveland OH USA Omah S Singh MD Director New England Eye Center Beverley MA USA Karen Sisley BSc PhD Non-Clinical Lecturer Ocular Oncology Academic Unit of Ophthalmology and Orthoptics University of Shefﬁeld Shefﬁeld United Kingdom Arthur J Sit MD Assistant Professor of Ophthalmology Mayo Clinic Rochester MN USA David Smerdon FRCSEd FRCOphth Consultant Ophthalmologist James Cook University Hospital Middlesbrough United Kingdom William E Smiddy MD Professor of Ophthalmology Department of Ophthalmology Bascom Palmer Eye Institute Miami FL USA List of Contributors Ronald E Smith MD Professor and Chair Department of Ophthalmology Keck School of Medicine of USC Los Angeles CA USA Terry J Smith MD Professor and Head Division of Molecular Medicine David Geffen School of Medicine Harbor-UCLA Medical Center Torrance CA USA Neal G Snebold MD Ophthalmologist Massachusetts Eye and Ear Inﬁrmary Harvard Medical School Boston MA USA Lucia Sobrin MD Instructor of Ophthalmology Retina and Uvetis Services Massachusetts Eye and Ear Inﬁrmary Harvard Medical School Boston MA USA John A Sorenson MD Attenting Surgeon Vitreoretinal Service Manhattan Eye, Ear, and Throat Hospital New York NY USA Sarkis H Soukiasian MD Director: Cornea and External Disease Director: Ocular Inflammation and Uveitis Lahey Clinic Burlington MA USA George L Spaeth MD FRCO FACS Louis Esposito Research Professor of Ophthalmology Jefferson Medical College Director of the William & Anna Goldberg Glaucoma Service Wills Eye Institute Philadelphia PA USA Richard F Spaide MD Associate Clinical Professor of Ophthalmology Manhattan Eye, Ear, and Throat Hospital New York NY USA Monika Srivastava MD Clinical Assistant Professor Department of Dermatology New York University New York NY USA Sunil K Srivastava MD Assistant Professor of Ophthalmology Section of Vitreoretinal Surgery & Disease Emory Eye Center Atlanta GA USA Alexandros N Stangos MD Division of Ophthalmology Department of Clinical Neurosciences University Hospitals of Geneva Geneva Switzerland Tomy Starck MD Director UltraVision Center San Antonio TX USA Walter J Stark MD Professor of Ophthalmology Director of the Stark-Mosher Center The John Hopkins Hospital, Wilmer Eye Institute Baltimore MD USA Joshua D Stein MD MS Assistant Professor Department of Ophthalmology and Visual Sciences Kellogg Eye Center Ann Arbor MI USA Roger F Steinert MD Professor of Ophthalmology and Biomedical Engineering Director of Cornea, Refractive and Cataract Surgery Vice Chair of Clinical Ophthalmology Department of Ophthalmology University of California Irvine Irvine CA USA Leon Strauss MD Instructor Wilmer Eye Institute John Hopkins University School of Medicine Baltimore MD USA Barbara W Streeten MD Professor of Ophthalmology and Pathology State University of New York Upstate Medical University Syracuse NY USA J Wayne Streilein MD (deceased) Formerly Senior Scientist, President, Charles L Schepens Professor of Ophthalmology, Professor of Dermatology Formerly Vice Chair for Research, Department of Ophthalmology Harvard Medical School Boston MA USA James D Strong CRA Senior Ophthalmic Imager Department of Ophthalmology Penn State Milton S Hershey Medical Center Hershey PA USA Ilene K Sugino MS Director, Ocular Cell Transplantation Laboratory Institute of Ophthalmology and Visual Science New Jersey Medical School Newark NJ USA Eric B Suhler MD MPH Chief of Ophthalmology Portland VA Medical Center Assistant Professor of Ophthalmology and Co-director Department of Ophthalmology Casey Eye Institute Portland OR USA Timothy J Sullivan FRANZCO FRACS Eyelid, Lacrimal and Orbital Clinic Department of Ophthalmology Royal Brisbane Hospital Herston QLD Australia Jennifer K Sun MD Lecturer Joslin Diabetes Center Beetham Eye Institute Harvard Medical School Boston MA USA Janet S Sunness MD Medical Director Richard E Hoover Rehabilitation Services for Low Vision and Blindness Greater Baltimore Medical Center Baltimore MD USA Francis C Sutula MD Milford Eye Care Milford MA USA Nasreen A Syed MD Assistant Professor, Ophthalmology and Pathology Department of Ophthalmology and Visual Sciences University of Iowa Iowa City IA USA Christopher N Ta MD Associate Professor of Ophthalmology Department of Ophthalmology Stanford University Palo Alto CA USA Hidehiro Takei MD Staff Pathologist Department of Pathology The Methodist Hospital Houston TX USA Jonathan H Talamo MD Associate Clinical Professor of Ophthalmology Department of Ophthalmology Harvard Medical School Waltham MA USA Richard R Tamesis MD Department of Ophthalmology Loma Linda University Medical Center Loma Linda CA USA Madhura Tamhankar MD Associate Professor Department of Ophthalmology University of Pennsylvania Medical School Philadelphia PA USA Kristen J Tarbet MD SACS Private Practice Bellevue WA USA xli List of Contributors Michelle Tarver-Carr MD PhD Assistant, Ocular Immunology Wilmer Eye Institute Departments of Medicine and Epidemiology Johns Hopkins University School of Medicine Baltimore MD USA Mark A Terry MD Director, Corneal Services Clinical Professor, Department of Ophthalmology Devers Eye Institute Oregon Health Sciences University Portland OR USA Joseph M Thomas MD Associate Clinical Professor Department of Neurology Case Western Reserve University School of Medicine Cleveland OH USA Vance Thompson MD Assistant Professor of Medicine University of South Dakota School of Medicine Director of Refractive Surgery Sioux Valley Clinic Vance Thompson Vision Sioux Falls SD USA Jennifer E Thorne MD PhD Assistant Professor of Ophthalmology Division of Ocular Immunology Wilmer Eye Institute Baltimore MD USA Matthew J Thurtell BSc(Med) MBBS MScMed Neuro-Ophthalmology Fellow Department of Neurology Royal Prince Albert Hospital Sydney NSW Australia David P Tingey MD FRCSC Associate Professor Ivey Eye Institute London Health Sciences Center London ON Canada King W To MD Clinical Professor of Ophthalmology Brown University School of Medicine Barrington RI USA Faisal M Tobaigy MD Department of Ophthalmology Massachusetts Eye and Ear Inﬁrmary and the Schepens Eye Research Institute Harvard Medical School Boston MA USA Michael J Tolentino MD Director of Research, Center for Retina and Macular Disease Center for Retina and Macular Disease Winter Haven FL USA xlii Melissa G Tong BSc Department of Medicine Jefferson Medical College Philadelphia PA USA Gail Torkildsen MD Physician Andover Eye Associates Andover MA USA Cynthia A Toth MD Associate Professor of Ophthalmology and Biomedical Engineering Duke Eye Center Durham NC USA Elias I Traboulsi MD Professor of Ophthalmology The Cole Eye Institute Cleveland OH USA Michele Trucksis PhD MD Associate Clinical Professor Harvard Medical School Associate Director Clinical Pharmacology Merck & Co. Previous Previous post: Download e-book for kindle: Ultrasonography in Ophthalmology 11: Proceedings of the 11th by W. Haigis, W. Buschmann (auth. ), Dr. J. M. Thijssen, J. S.